I love Taco Bus! This place would go unnoticed if you were driving by ….. but aren’t those sometimes the best places to eat? I found this place by using my Foodnetwork app on my phone. I’ve been there twice and any time I’m near one I think I’ll have to stop. This last trip I found out I could buy the taco sauce. Lucky for me I had a cooler to keep it in! We brought it all the way back from Florida to Indiana. Anyway, I think their shredded pork tacos are to die for so I tried to make some at home. The thing I love about these is the simplicity. 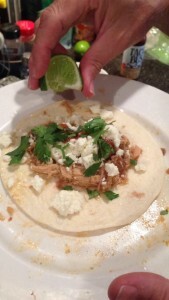 They use Shredded Pork, Queso Fresco, Shredded Cabbage, Cilantro and Lime. I had to make up the spices based on what I thought they used. But, this is a favorite at my house. I’ll post some Taco Bus photos from my past trips there in a later blog. Maybe I’ll do some Throwback Thursdays!